Gov. Peter Shumlin speaks to reporters at the Montpelier news conference Tuesday. At about 4 p.m. on the second-to-last day of 2014, Gov. Peter Shumlin released a report detailing why he made the December 17 announcement that he was scrapping plans to establish the first-in-the-nation statewide government-financed health coverage system. The report is long and detailed. Shumlin insisted the pre-New Year's Eve document dump was not intended to hide anything, but instead was to release the data that's available as soon as possible. The beauty of the report is that it’s online and available for all to read here. 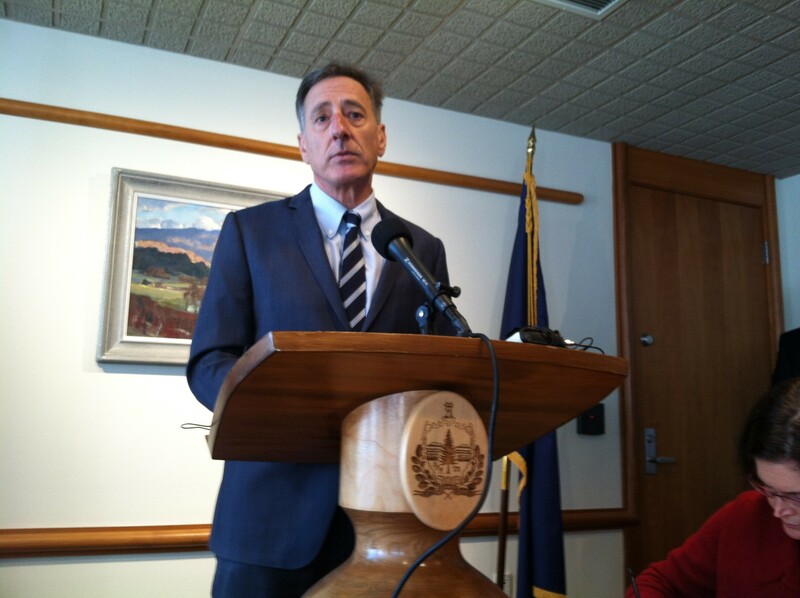 At a news conference earlier Tuesday, Shumlin emphasized that while he had dropped the single-payer plan after determining it was too expensive, he will continue to push for changes in the way health care providers are paid. His goal, he said, is to move by 2017 from the current fee-for-service payment method to reimbursing providers for health care outcomes. Shumlin said he’ll ask the legislature in his budget address in mid-January to make changes that will help toward that goal. That will include boosting the regulatory authority of the Green Mountain Care Board. It’ll take some money, too, and cooperation of health care providers, he said. All this presumes lawmakers affirm his election next week. Slightly more than a month after Shumlin came away from the election with a bare lead over Republican Scott Milne, the two-term Democrat announced that his long-touted health care plans didn’t work out. Shumlin contended he lacked the detailed information to make that decision until after the election. “We weren’t sitting around for years with a plan,” he said. His team determined that an 11.5 percent payroll tax and an income tax ranging from nothing to 9.5 percent would be needed to fund universal coverage for Vermonters.